Rest in Peace, Stan Lee - Honk if you love justice! I think most of us know that Stan Lee’s legacy at Marvel for comics is fraught. Who truly created what, who deserves credit. That’s covered elsewhere, like the obituary/profile linked above. I’d like to talk about Stan’s place in my life, as a budding geek who wasn’t sure of his place in the world. Millenials, for the most part, only know Stan Lee as the kindly Grandpa who pops up in the movies to chew a bit of scenery. For those of us around in the early 80s through the 90s, Stan was EVERYWHERE that Marvel characters were. Stan Lee moved to California to hustle them into TV and movies, and he gave it his whole heart. Spider-Man and His Amazing Friends? Stan Lee opened every episode. The Incredible Hulk? He’s there too. Every entertainment TV show, late night, daytime, game show, he was always putting Marvel out there. The consummate showman. Stan Lee always wore his heart on his sleeve, and his enthusiasm for comics as an art form was infectious. You knew he was selling you, but he was so darn earnest about it you couldn’t help but grin along. It helped that he seemed like a genuine good person, trying his best to push, in his own way, for civil rights and equality. The world would be better than it is now if more people had gotten his message. 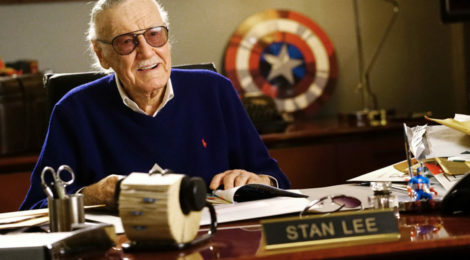 Excelsior, Stan.